The Orthodontics by Birth, Stewart, & Fletcher team wants to hear from our patients! We appreciate you sharing your experience that you had with us. 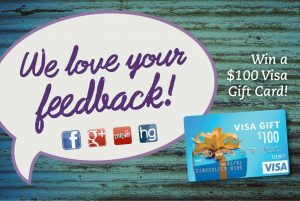 Review us on Facebook, Google+, Healthgrades, or Yelp and be entered in a monthly drawing for a $100 Visa Gift Card. Get all of the links at https://www.bsfortho.com/review-us/.